Aether & Hemera have been selected for creating an artwork to commemorate the end of World War One. HOPE is a light and sound installation, inspired by the life experiences of the people of County Durham to commemorate their hope, humanity and resilience, even in the bleakest of times. More info here! Our fltilla of origami boats will be in the 'Percours n.11' at Les Berges de la Moselle alongside dozens of other exciting artworks and performances. Here to see the full programme. 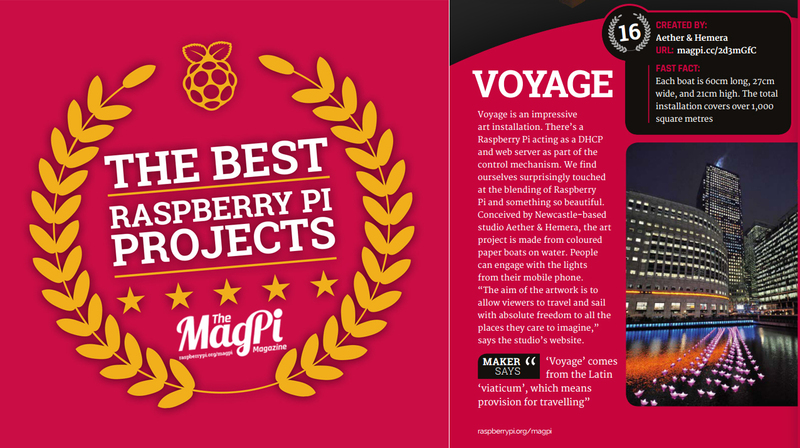 We are so trilled that our artwork Voyage is a winner in the official Raspberry Pi magazine’s 50th issue celebration feature voted by the Raspberry Pi community. enjoy these 50 amazing Raspberry Pi projects!